Linenfold is one of those words that kind of explains what it is, right in the word itself. It’s a form of carved decoration, similar to folded linen in appearance. The item pictured here is the top (shade portion) of a Tiffany Studios Aladdin linenfold floor lamp. The bronze 12-sided shade has amber Favrile “fabrique” linenfold panels, and a pierced top. 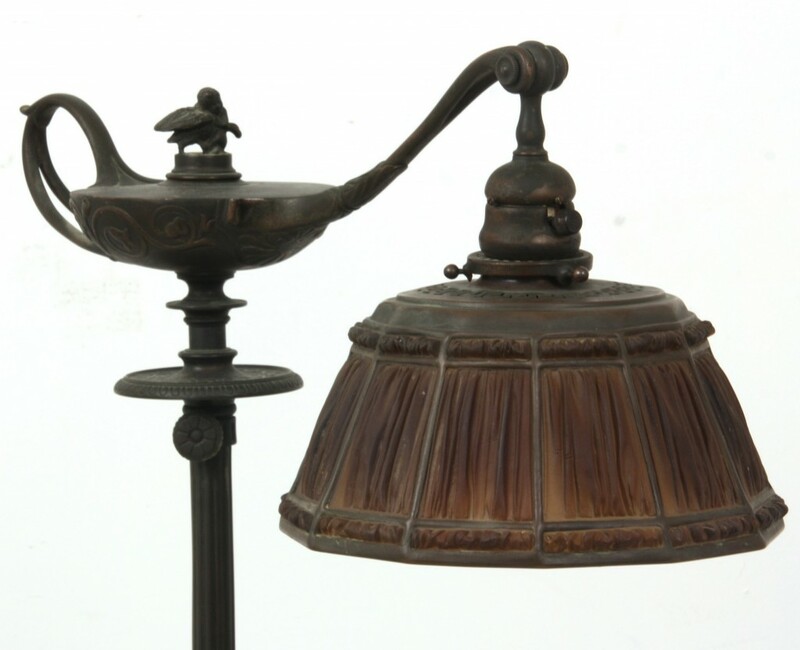 The lamp is lot #47 in Fontaine’s Auction Gallery’s upcoming June 17th auction, online and at the firm’s gallery in Pittsfield, Mass. Of course, with the Tiffany name comes a princely estimate – $8,000-$12,000. Linenfold is a simple style of relief carving, used to decorate wood paneling. The design is meant to imitate folded linen (or window tracing or any stiffly folded material). It originated in Flanders and quickly spread in popularity throughout northern Europe in the 14th-16th centuries. It wasn’t called linenfold then; that word was coined by early 19th century antiquarian connoisseurs, from the Latin lignum undulatum (or “wavy wood”). Around that time, it returned to fashion, as linenfold paneling reappeared in the revivals of the Gothic and Tudor styles.